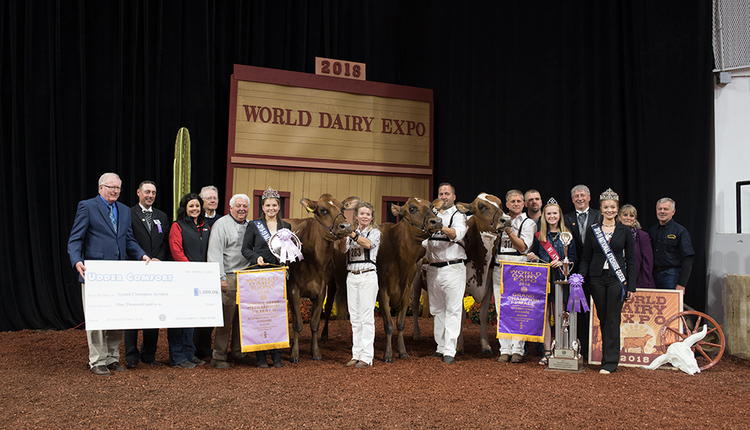 A cow from Maryland earned back-to-back wins when she was named Grand Champion of the 2018 World Dairy Expo International Ayrshire Show. The colored shavings at World Dairy Expo are nothing new for Palmyra Berkley P Ruth-ET, as she earned Grand Champion honors at the International Ayrshire Show for the second year in a row. The winning 4-year-old cow was also named Senior Champion Female and the Total Performance Winner. She was exhibited by Palmyra Farm and Evan Creek of Hagerstown, Md. “She is a truly balanced cow with an incredible frame,” said Judge Callum McKinven of Canton de Hatley, Quebec, Canada. His associate judge was Dean Malcolm of Victoria, Australia. The Intermediate Champion was Old-N-Lazy Dream Of A Diva. She is owned by Rosedale Genetics and Mike Maier of Oxford, Wis. The Reserve Intermediate Champion was Palmyra Shockwave BP Rosy, owned by Kurt Wolf and John Cannon of Epworth, Iowa. Junior Champion of the show was KnH-Endres Burdette Mayhem. The summer yearling was exhibited by Leslie and Linda Bruchey of Westminst, Md. Reserve Junior Champion honors went to Jomill Burdette Kalliope, a fall calf owned by Glamourview-Iager and Walton. In the Junior Show, Grand Champion was Toppglen Wishful Thinking-ET, exhibited by Tanner, Brennan, Marissa, and Logan Topp of New Bremen, Ohio. Reserve Grand Champion was River Valley Gavins Brooke, owned by Megan, Jonathan, Bradley, and Sarah Hill from Bristol, Vt. The Junior Champion of the Junior Show was Four-Hills Burd Sassy 64671, exhibited by Jonathan Hill of Bristol, Vt. The Reserve Junior Champion was Lazy M Distinct Lanie, shown by Mikayla Endres of Lone Rock, Wis. In all, 273 animals were exhibited during the International Ayrshire Show. The Premier Breeder of the Heifer Show was Lazy M Farm of Stitzer, Wis. Palmyra Farm of Hagerstown, Md., took home the honors of Premier Breeder and Premier Exhibitor. Premier Sire of both the heifer show and overall was Palmyra Tri-Star Burdette-ET.